HMS Indefatigable was built at Bucklers Hard between 1781 and 1784 as a 64 gun third rate, however she was not commissioned until 1794 when she was razeed to become a 44 gun frigate under the command of Sir Edward Pellew, who remained her captain for the next five years. Pellew had already made a name for himself as an audacious frigate commander and he went on a to have a long and distinguished naval carreer. He served as Commander in Chief of the East Indies Station and the Mediterranean Fleet, was feted as the hero of the Bombardment of Algiers and retired from active service as Admiral Lord Exmouth in 1816. Despite such notable achievements, the Indefatigable was arguably Pellew’s most famous and successful command and the one that remained closest to his heart. Throughout his career Pellew was renowned, and in some quarters critiscised, for the patronage he extended to the young men that served under him and the crew of the Indefatigable, many of whom had followed him from his previous commands, the Nymphe and the Arethusa, were no exception. And why 1797? On the 13th of January 1797 the Indefatigable and the Amazon took on the French ship of the line the Droits de L’Homme in an engagement that to this regarded to this day as one of the boldest frigate actions of the French Revolutionary War. 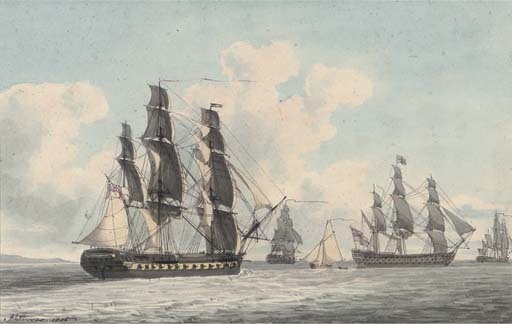 Since 2010 my research colleague Heather Noel-Smith and I have been attempting to chart the lives and careers of the 1797 crew of HMS Indefatigable through an examination of contemporary records and documents held in national, public and private archives in the UK, USA and France. Many of these young men, from diverse social backgrounds, went on to have distinguished careers both within and beyond the navy and many of them maintained an ongoing professional and personal relationship to their former captain, Sir Edward Pellew, later 1st Viscount Exmouth. 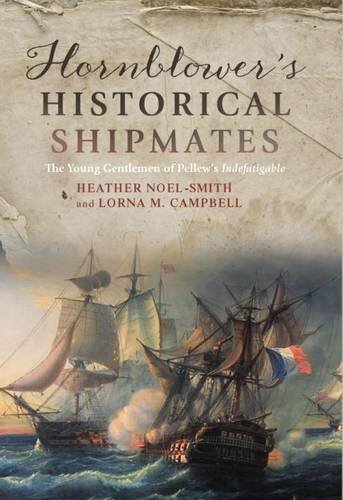 Heather and I have presented our research at a number of history conferences, and our book Hornblower’s Historical Shipmates: The Young Gentlemen of Pellew’s Indefatigable was published by Boydell and Brewer in September 2016. Hornblower’s Historical Shipmates is available from Amazon. In 2014 I was appointed as Chair of the Society for Nautical Research Publications Committee and I am also a Member of Council. I have written (very) occasional blog posts for the Port Towns and Urban Cultures research group and co-chaired the Maritime Masculinities Conference at St Anne’s, University of Oxford, in 2016. Noel-Smith, H. and Campbell, L.M., (2018),“I shall be anxious to know…”: Lives of the Indefatigable Women, The Trafalgar Chronicle, New Series 3, Seaforth Publishing. Campbell, L.M. and Noel-Smith, H., (2015), “You Are a Very Naught Admiral Indeed”, in The Mariner’s Mirror, Vol. 101:2, May 2015. Noel-Smith, H. and Campbell, L.M., (2013), The Christian and The Hero: A study in the contrasting church and community service of Edward Pellew (1757 – 1833) and Thomas Groube (1774 – 1850), in The Light, Annual Journal of St Hildeburgh’s Parish Church Hoylake, No. 1, June 2013.